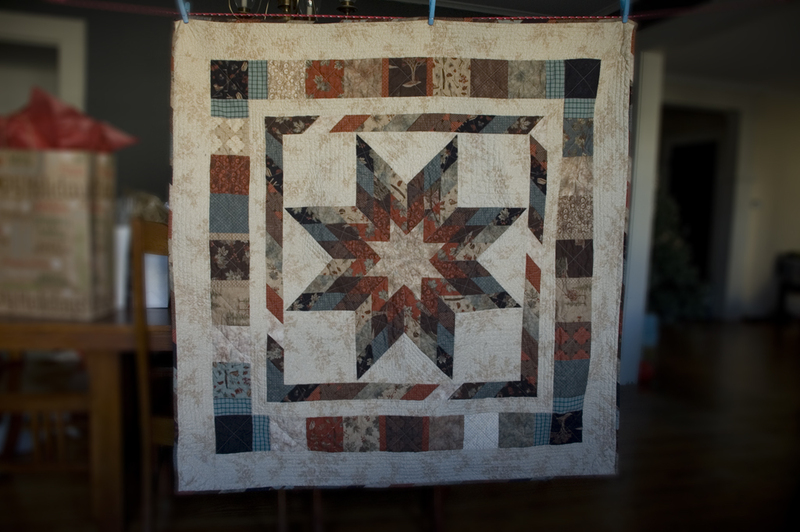 It’s Christmas week and we’re on vacation, but it’s time to unveil the finished Strip-pieced Lone Star/Star of Bethlehem quilt. You got a sneak preview last month, when I reviewed Nature’s Touch batting, so without further ado, here is the full quilt. I’ve been waiting for snow to photograph it outside, but here we are Christmas Eve (well, when I wrote this), and Utica’s had no snow stick yet this season. So, these photos I took inside will have to do. Most of the fabric is A Simpler Time by Holly Taylor for Moda. The background is a print from Somerset Cottage, and there’s a small amount of teal/brown homespun on the front (and used on the back). It’s made using a jelly roll and charm pack of A Simpler Time. I started out planning on making a quilt from Jelly Roll Quilts, but decided that one star was more than enough (instead of four). 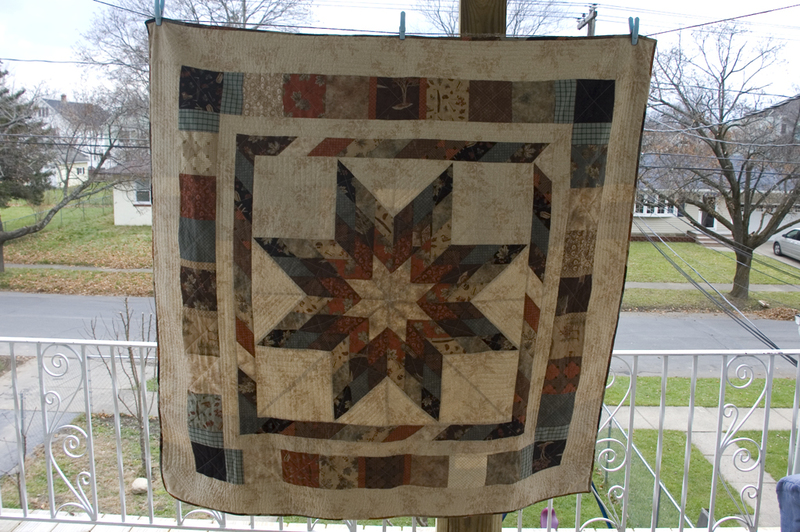 Once I had the star done, I planned the rest of the quilt to use the strips I’d already cut to make the other stars in the original pattern, so those became the inner border and binding of the quilt. 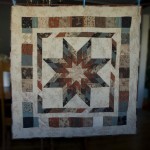 With all four borders added, the quilt is 56″ square—and it actually is almost perfectly square! I did have to do some major blocking to the star to make it square(ish) before adding the borders though. I used the majority of the charm pack for a wide border on the outside, adding a bit of the homespun because the only charms left were too close in color to the background fabric. There were five or six leftover jelly roll strips that weren’t used for the same reason. 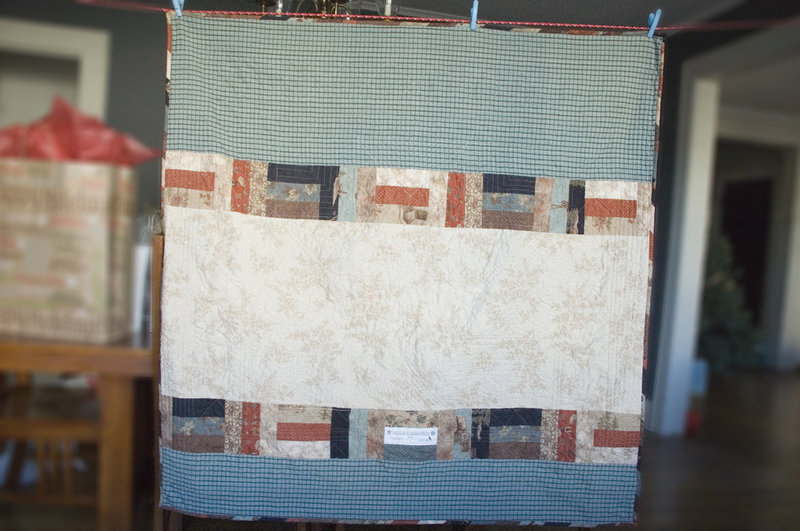 I pieced the back to use up the strip sets I’d sewn together but hadn’t actually cut up yet, so there are two rows of rail fence blocks, a custom label, more of the Somerset Cottage print, and the homespun. I don’t know how I managed to get the back so well-aligned to the front, but it’s almost spot on so that my quilting lines are straight on the front and back of the quilt. I have a feeling I’ll never be able to do that again. 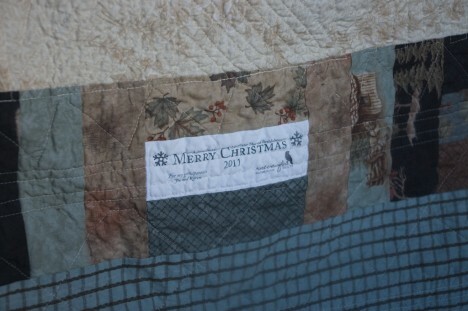 I used Pellon Nature’s Touch batting and quilted it with cream thread (Güttermann). I didn’t plan out the quilting, really, just had a sort of general idea, put it under the presser foot and made decisions as I went. 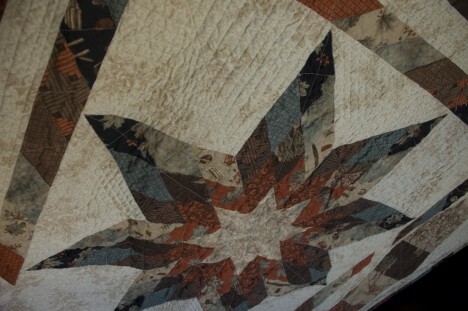 The pieces in the star and colored borders are all bisected or stitched-in-the-ditch, while the background has straight-line echos that are around .5″ apart (more or less the distance from needle to side of my walking foot, although some are eyeballed/needle position moved so that they are slightly further apart). It took 6.5 bobbins and reminded me that I should really remember to wind more at the start, as I blew through my four original ones and had to wind more. The outermost border took more than one bobbin on its own. This actually wasn’t a very time-intense quilt. I finished the top and back piecing over the summer, then quilted it in a weekend in November. I gave it to my grandparents for Christmas, so I can finally unveil it here. I think I’ll do another lone star at some point in the future, maybe. Getting the points to match was tricky (and I wasn’t too crazy about ripping, so many of them don’t, perfectly), but there are so may variations to do the star that look awesome. Although, really cool ones are often made of teeny-tiny diamonds, so maybe not. I love the colors, and almost want to find the fabric so that I can make a duplicate for our house. While I was waiting for the weather to cooperate for photos, I kept finding Carl draping it artfully in the living room, or trying to steal it (tough luck, it’s already labeled). Here’s a slightly more color-correct view of the front from before it was washed. The wind picked up and I couldn’t get shots of the back that day. That’s the last pieced quilt I completely finished this year, bringing me to eight in 2011 (including the one from last week), nine total, not to mention myriad other smaller projects. 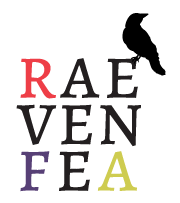 I think I’m going to aim for ten finished in 2012, so stick around! 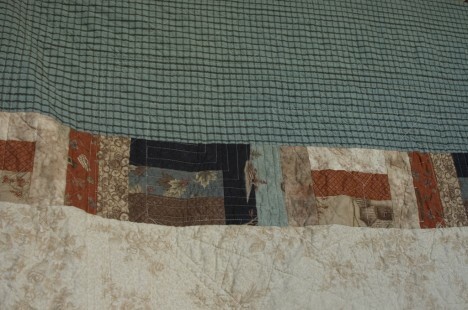 Do you have a goal for quilts to finish by the end of 2011 (or for next year)?